The first important key to appreciating Michael A. Greco’s production is an acceptance of its quiet descriptions and contrasts between Japanese and American cultures. His approach to description, which might seem so exquisitely wrought to some (as in the passage above, which will particularly appeal to poets with a solid appreciation of metaphorical color), might feel a bit too slow to others. Readers who approach this story awaiting a crescendo of action may thus be disappointed, but others able to see this novel for what it is–an astute, reflective piece taking the time to peel away layers of Japanese psyche and society like an onion–will discover riches in the odd cast of characters, quirky old house, efforts of an English teacher to absorb Japanese culture, and the haunting reflections of a different kind of sentient house that holds the heartbeat of Japan within its walls. There are no seismic events in this story: no shocking confrontations or thriller-style moments. Indeed, its winding plot and characters sometimes thwart the reader’s logical understanding as much as the historically enigmatic Japanese culture may defy neat categorization and pat interpretation. As a result, some readers might see the story as elusive and puzzling. Perhaps the best prerequisite to a thorough appreciation of Greco’s tale is to hold a prior appreciation of surrealism art’s ability to take familiar places and objects and skew them for a different, thought-provoking result. Viewed in this manner, the fine art of cultural inspection and impressions give Plum Rains on Happy House a unique literary feel that sets it apart from other stories. This story will especially please wordsmiths and poets, as well as those familiar with Japanese culture and scenarios. These audiences will find the literary work delightful and evocative where everyday readers might find it hard to pin down and challenging, and will appreciate the haunted house’s major role in influencing “the Ichiban” and his obsessions. The house is flowering–and so will the reader, if they allow proper time to walk Plum Rains on Happy House’s surreal hallways. 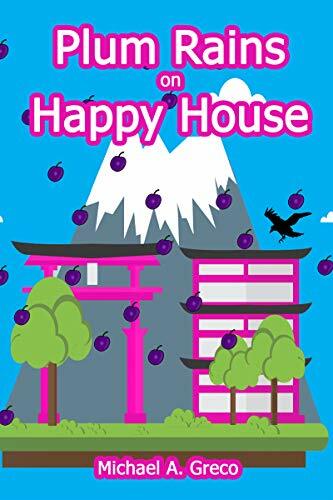 This is a gem of metaphorical description, and provides insights that linger in the mind long after the mysterious, true nature of Happy House draws to an end. We review Indie authors. Great ones. Will you be next? Here at PDR, we specialize in discovering new writing talent. Best sellers. And those whose clear new voice needs to be appreciated by a wide audience. Need a review that gets noticed? Enter your email address to subscribe to this blog and receive notifications of new reviews by email.